“Imagine a sport yacht built by Pursuit and powered by Yamaha. Pursuit’s Patent Pending design of the all new SC 365i will revolutionize the way you experience yachting.” Indeed, as Pursuit claims in this statement, its brand new and all new SC 365i is indeed revolutionary in the pleasure boat market and one which may require you to sit back and hang on as you contemplate its features and benefits. 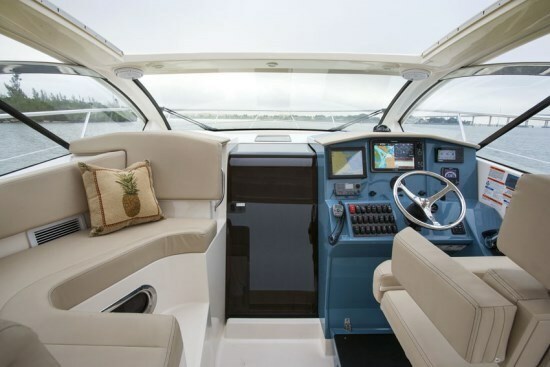 Pursuit Boats of Fort Pierce, Florida, part of the Tiara Yacht family of Holland, Michigan, has long been a builder of upscale centre console, dual console, and offshore cabin fishing and multi-purpose boats. 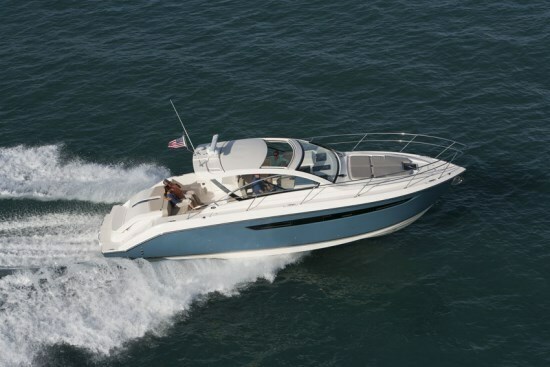 In recent years, all models including this year’s offerings of a total of sixteen models from eighteen to thirty-eight feet in five series are all outboard powered. The SC 365i Sport Coupe subject of this review is Pursuit’s first foray into the luxury sport yacht segment, but unique in the market yet true to its beliefs, Pursuit powers it with a pair of Yamaha F350 counter-rotating, 5.4 L, 350 horsepower, four-stroke outboard motors. But here’s the thing. Study the pictures. Do you see any sign of outboards hanging off the transom? Absolutely not. And that’s the clue to the letter “i” in the model designation of this yacht. The “i” stands for “integrated.” The outboards are integrated into the overall deep 20° deadrise hull design of the SC 365i and fully enclosed so they are not outwardly visible. But why outboards at all you may ask? Why not sterndrive or inboard power like normal? 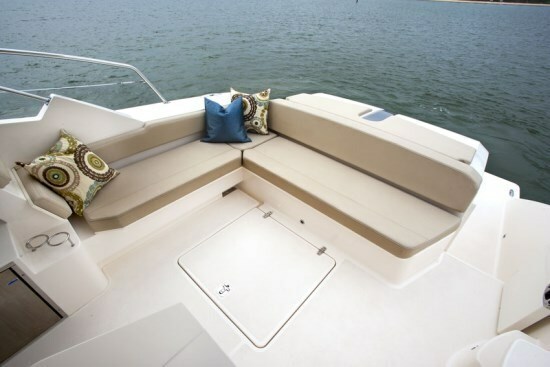 Pursuit will tell you that by hanging the outboards off the transom, so much more depth and volume is created in the cockpit and interior that this 41’2” LOA vessel on its 12’6” beam offers remarkably greater and usable interior room than other yachts of this size which are powered by inboards or sterndrives. 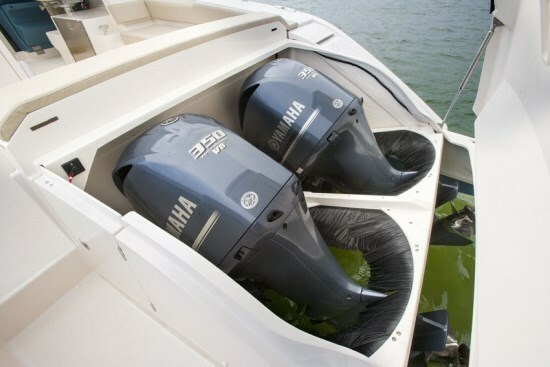 On top of that, the performance and efficiency advantages from the use of outboards are remarkable. It is very difficult to do justice to a revolutionary new boat like this SC 365i in a short review like this one so only the highlights can be presented. 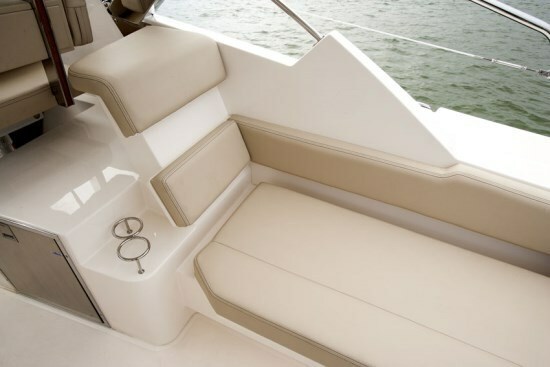 Like all new Pursuit models, an infused fibreglass structural molded finish grid system forms the backbone of the boat and the Yamaha outboards are mounted on a 5-ply resin infused composite transom system with patented transom reinforcement grid. The entire deck and cockpit liner is a single one-piece molded unit. A full width molded swim platform with boarding ladder behind the fully enclosed motors provides handy water access and a port side entry from here leads to the cockpit. 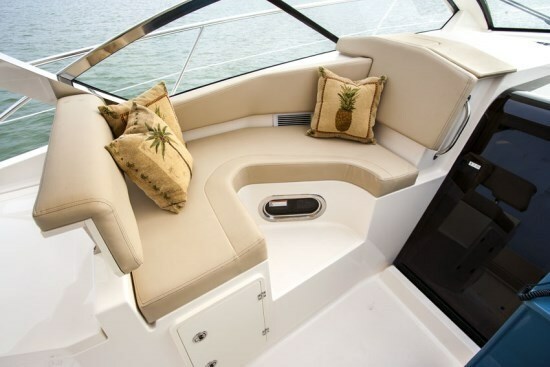 A starboard side lounge flows into a transom lounge seat providing L-shaped cockpit seating. Just ahead of the starboard lounger is a standard cockpit stainless steel-fronted refrigerator. 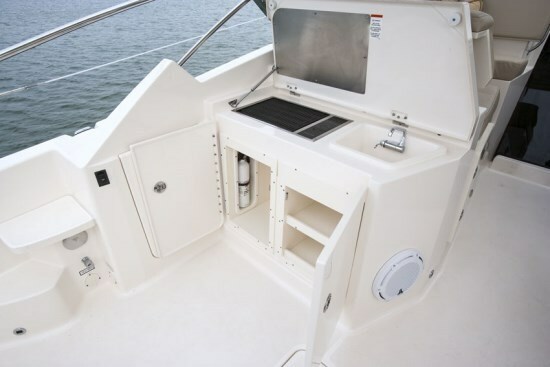 Opposite on the port side and aft of the U-shaped passenger helm lounge is a molded entertainment center with sink, faucet, and standard electric grill. A custom molded cockpit table with teak accents and dedicated storage is also standard. A single piece, laminated, bonded windshield system offering unobstructed forward visibility is fully integrated with a molded fibreglass hardtop complete with a full-width opening sunroof. 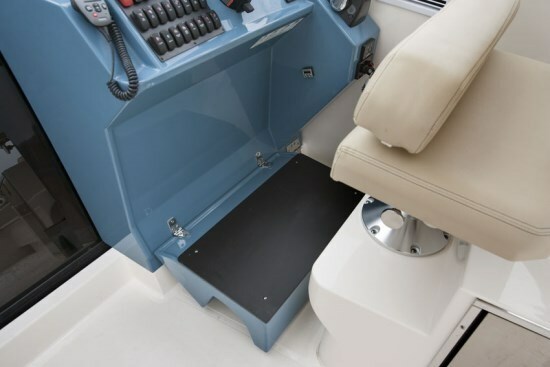 The custom, fully adjustable helm chair provides the driver with all-day comfort while facing the practical layout of the helm console which is hinged to open its full height for ease of maintenance or installation access. A centre molded, acrylic screened door provides access from the cockpit to the cabin below which provides lots of headroom. This entire cabin is also fibreglass lined – floors, walls, and headliner – for ease of maintenance and structural rigidity. Solid wood floors cover the fibreglass. An electrically adjustable solid wood forward V-berth table becomes part of the conversion of this area to a forward queen-sized island bed. 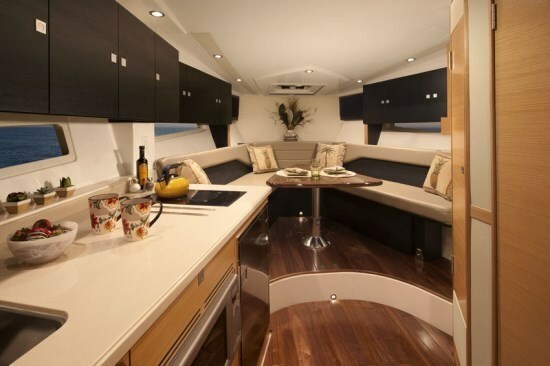 The portside galley features Corian® countertops, stainless sink, refrigerator, convection microwave, two burner glass top stove and loads of upper & lower cupboards. 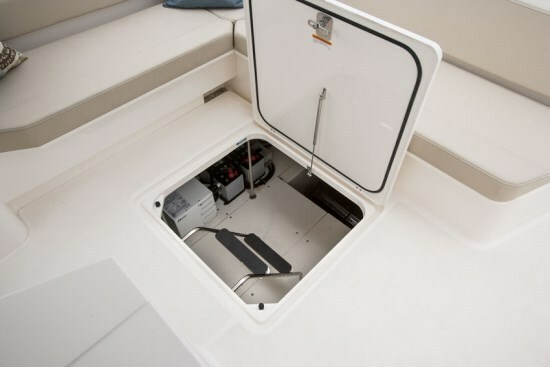 The fibreglass enclosed starboard side head compartment also has a Corian® countertop, “designer” glass sink, integral shower, and a full height storage cabinet. 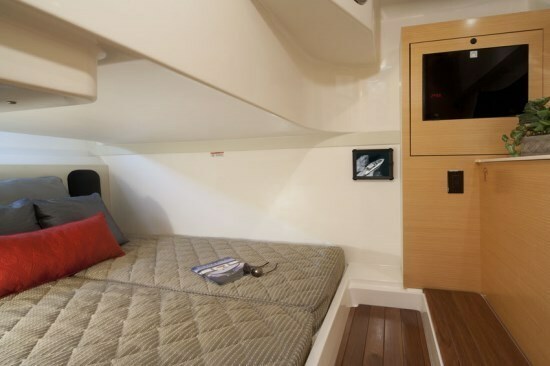 For a boat of this size, the mid-cabin will amaze you with its full-size, solid wood entry door and stand-up headroom inside along with its full-beam bed with inner-sprung mattress plus storage and hanging locker. Cabin entertainment is provided by a Pursuit entertainment center with 26” LED Apple smart TV, iCloud account, iPad, 12v stereo with internet radio, speakers (8 total, 4 in cockpit, 4 in cabin), subwoofer in cockpit, with Bluetooth remote. Reverse cycle heat and air conditioning is standard in the cabin and a second unit is optional for the cockpit. An 8kw Panda diesel generator is also standard equipment. 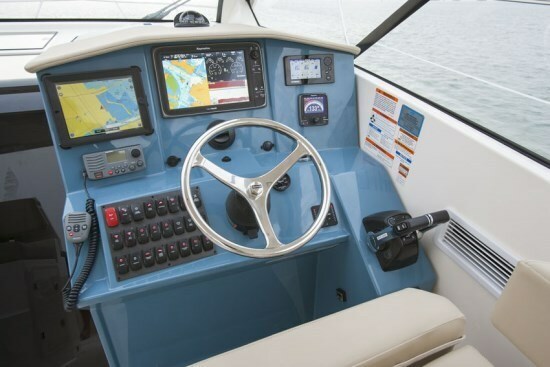 Notable optional equipment includes a recessed foredeck sunpad with adjustable headrest, a fishing package with rodholders and outriggers, bow thruster, shorepower cable reel, Raymarine® electronics packages including radar and auto-pilot, and upgraded Yamaha® digital electronic engine management gauges and interfaces.